Staff Nurse - 21 Posts - Basic Pay 9300 Grade Pay 4600 in Pay Band II category - Diploma in General Nursing and Midwifery - Age 37 years. Pharmacist (Allopathy) - 1 Post - Basic Pay 5200 Grade Pay 2800 in Pay Band I category - Degree in Pharmacy / Diploma in Pharmacy - Age 32 years. Pharmacist (Ayurvedic) - 1 Post - Basic Pay 5200 Grade Pay 2800 in Pay Band I category - Diploma in Ayurvedic with 3 years experience - Age 32 years. Operation Theatre Assistant (OTA) - 2 Posts - Basic Pay 5200 Grade Pay 2000 in Pay Band I category - 12th Std with one year experience in OT - Age 32 years. Laboratory Assistant - 2 Posts - Basic Pay 5200 Grade Pay 2000 in Pay Band I category - DMLT - Age 32 years. Junior Radiographer - 8 Posts - Basic Pay 5200 Grade Pay 2800 in Pay Band I category - Diploma in Radiography with one year experience - Age 32 years. Dresser - 5 Posts - Basic Pay 5200 Grade Pay 1800 in Pay Band I category - 10th Std Pass with 2 years experience - Age 27 years. 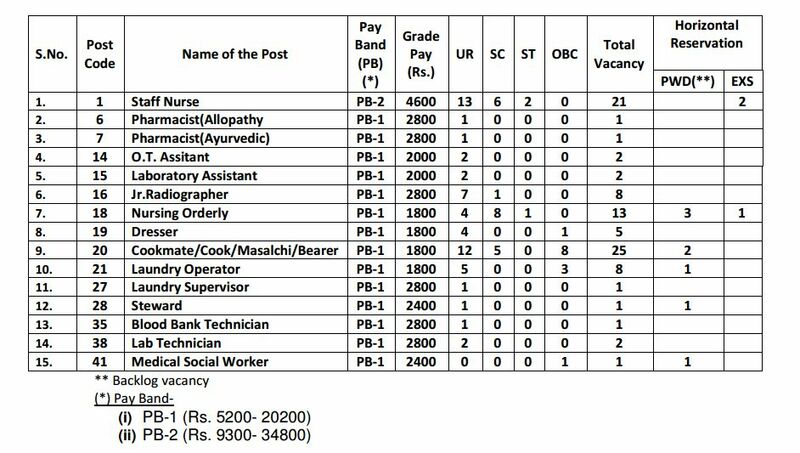 Cookmate / Cook / Masalchi / Bearer - 25 Posts - Basic Pay 5200 Grade Pay 1800 in Pay Band I category - 10th Std Pass with 2 years experience - Age 27 years.2 Posts for PwD(*). Laundry Operator - 8 Posts - Basic Pay 5200 Grade Pay 1800 in Pay Band I category - 10th Std Pass with 2 years experience - Age 32 years.1 Post for PwD(*). Laundry Supervisor - 1 Post - Basic Pay 5200 Grade Pay 2800 in Pay Band I category - 12th Std Pass with 3 years experience in supervisory level - Age 32 years. Steward - 1 Post - Basic Pay 5200 Grade Pay 2400 in Pay Band I category - 12th Std Pass with 2 years experience - Age 30 years.1 Post for PwD(*). Blood Bank Technician - 1 Post - Basic Pay 5200 Grade Pay 2800 in Pay Band I category - BSc Degree with 2 years experience in Blood Bank or DMLT with 2 years experience in Blood Bank - Age 32 years. Lab Technician - 2 Posts - Basic Pay 5200 Grade Pay 2800 in Pay Band I category - 12th Std and DMLT with one year experience - Age 32 years. Medical Social Worker - 1 Post - Basic Pay 5200 Grade Pay 2400 in Pay Band I category - Degree or Diploma in Social Works with one year experience - Age 37 years.1 Post for PwD(*).